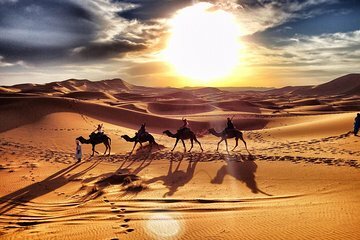 This 2-day Zagora desert tour out of Marrakech is capped at just seven people but still delivers excellent value in limited time. Travel through the High Atlas to the Ksar of Ait-Ben-Haddou then along the Draa Valley to Zagora, where you ride a camel over the dunes to your desert camp. Enjoy dinner, overnight, and breakfast in the desert before returning to Marrakech with a stop in Ouarzazate.